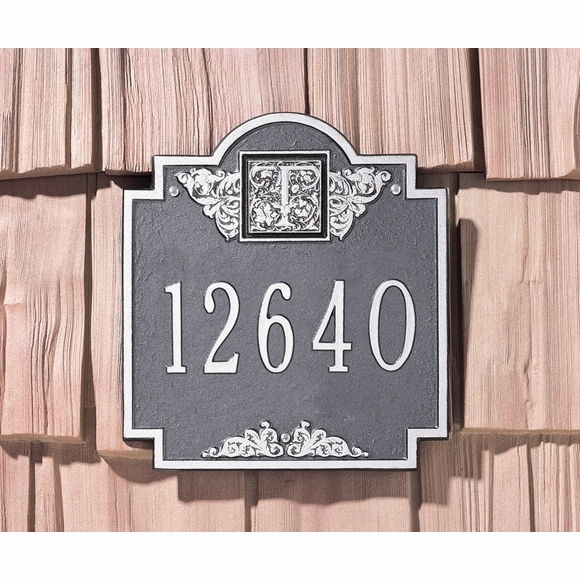 Personalized Address Sign with Initial Monogram - - 10.75" x 11.75" enhanced square shape. Wall mount. Made in USA. The one-line version holds up to five (5) 3" numbers or twelve (12) 1.25" characters. The two-line version holds up to five (5) 3" numbers on Line 1 and twelve (12) 1.25" characters on Line 2 as shown in the sample. the reverse: up to twelve (12) 1.25" characters on Line 1 and five (5) 3" numbers on Line 2. Shown above in pewter with silver characters and green with gold characters. Click top links in Related Products for the lawn-mount version and the 23.25" x 12.25" version of this sign.